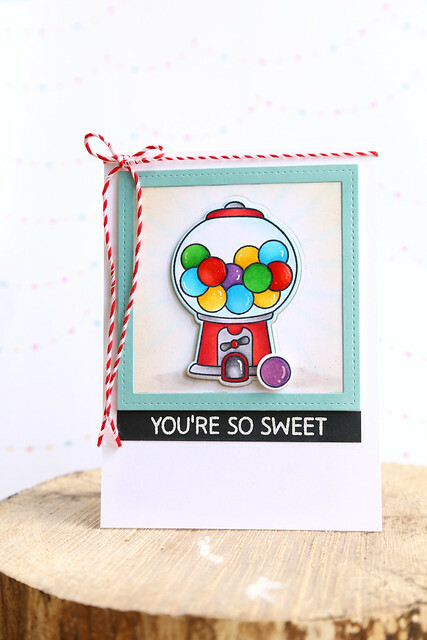 The Lawn Fawn design team is coming up gumballs, showing off the new Sweet Smiles stamp set. Before we go any further, I would like to preface my card by saying "I don't know." I don't know why I didn't add smiley faces to any of the gumballs. I meant to, after I was done coloring, but then my hand reached for the glossy accents and before I knew it they were covered and wet and glossy and it was too late. bah. At least on the purple one, right? I should have redone that one. Let's call this one a lazy card and have that out in the open. In any case, the gumball image is so cute, even without smileys. And I do enjoy the pop of black on the sentiment strip. Hi there! 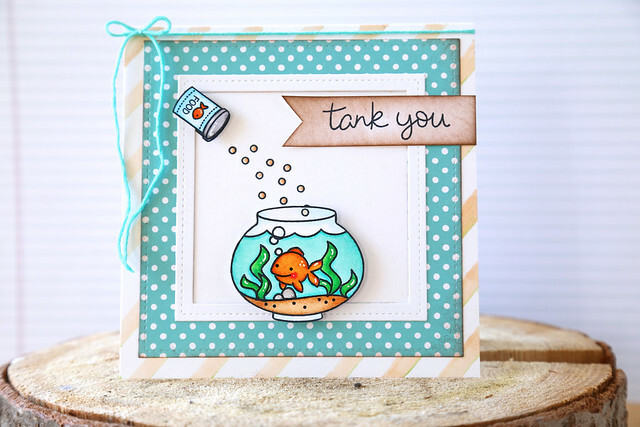 Today, the Lawn Fawn design team is showing off how fun it is to have dies for some older, favorite sets. There are now dies for Love 'n Breakfast! The excitement! I so wish there were dies when I was crafting *this interactive breakfast-themed card* for Gallery Idol a few years ago. Smiles start with breakfast and happy, bubble-gum colors. I used the chisel end of a few copic markers to casually paint out a striped background. I used the same pink to color the oval frame, and the same blue to color the breakfast tray. Hi there! 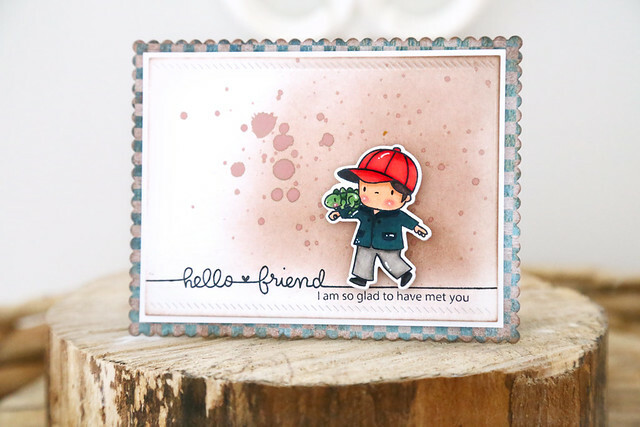 We're a few days into this month's Lawn Fawn inspiration week, and showing off the fun new alpha set, Owen's ABCs, today. I made a quirky card, and I think it was so quirky because it came together in little stages, over a few days. First, I created the little couple out of Sweet Smile gumballs. The round gumball outline provided the heads, and the faces were quickly stamped as well. I then doodled hair and tiny shoulders before framing them out. The background was created using the new Owen's ABCs. I used Lawn Fawn's mermaid ink, but stamped off onto scratch paper before inking the panel. It looks washed out and irregular in places, just like a sheet of vintage patterned paper. I hope you like this whimsical card! It would be a cute one for next Valentine's day! 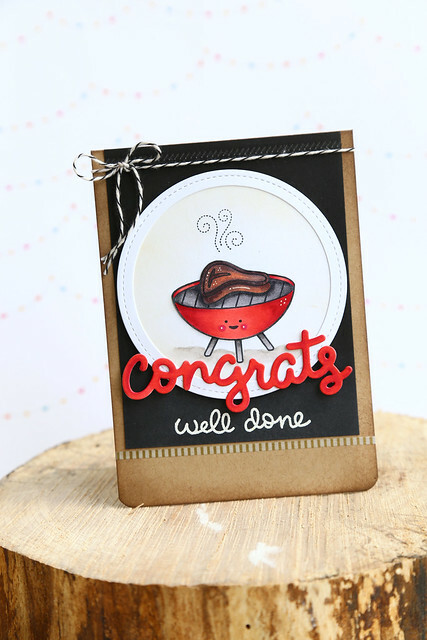 It's time for Lawn Fawn's June inspiration week, and we're kicking it off with a closer look at Let's BBQ. I colored the steak slightly charred, and paired the image with the scripty congrats, as well as the well done sentiment from this set. I didn't have a tomato-red cardstock to match my copic-colored BBQ, so I die-cut myself a white congrats and colored it with the same markers. Problem solved! Hi there! 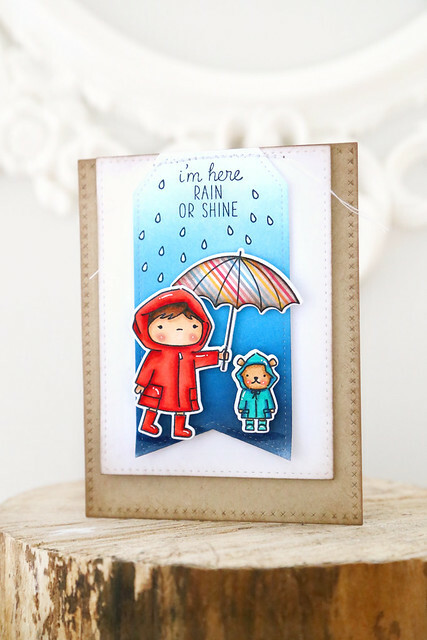 After a weekend hiatus, we're back to show off the last set of the new release, Chance of Rain. I love the larger-scaled kid images, and the tiny paddington bear. When my friend Jennifer was here, I set her to work ink blending a rainy background for me. It was the perfect backdrop for the girl and bear. 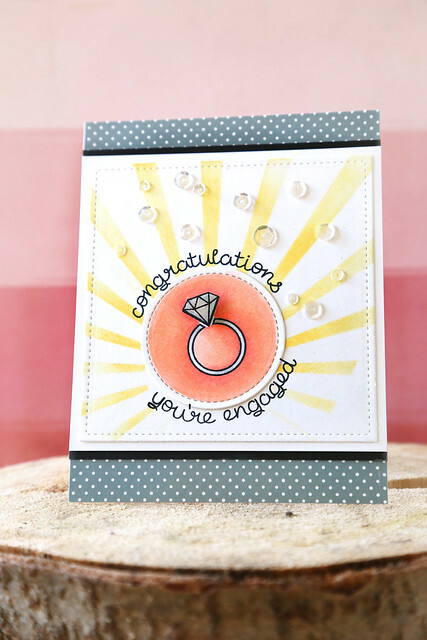 I stamped the sentiment at the top, and colored the raindrop outlines with a white gel pen. The good thing about unpacking boxes: the sewing machine was right. there. I haven't sewed on a card in forever, but it was already threaded and I was too lazy to find a spot for it in the new house... ha. ps, I'm giving one extra day to enter for a chance to win the Charmed stamp set. I'll announce a winner tomorrow morning. Click *here* to leave a comment if you'd like! I may be completely biased, but I think today is the best of all the stamp highlight days this month. I love Charmed so much, and not just because I drew the images. They're so dang cute! I colored the fox, the wreath, and the wavy banner with copics, die cut them, and propped them up on foam squares onto the white mat. I also stamped the little dotted line and dangled the heart from it. It's very simple, but the images make this card stand out! I hope you like it! There's more to see on the Mama Elephant blog today - click! 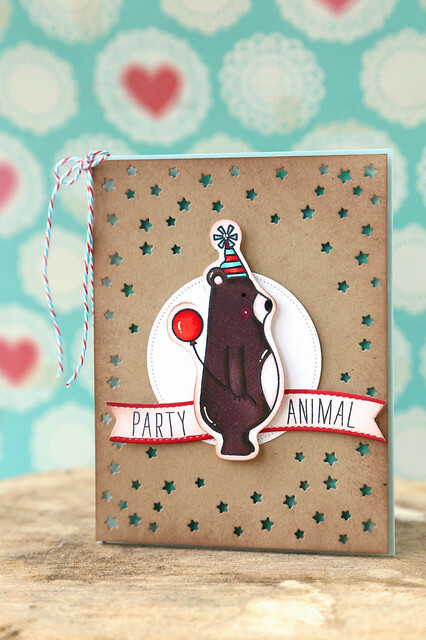 Welcome back to another day of Mama Elephant stamp highlights. 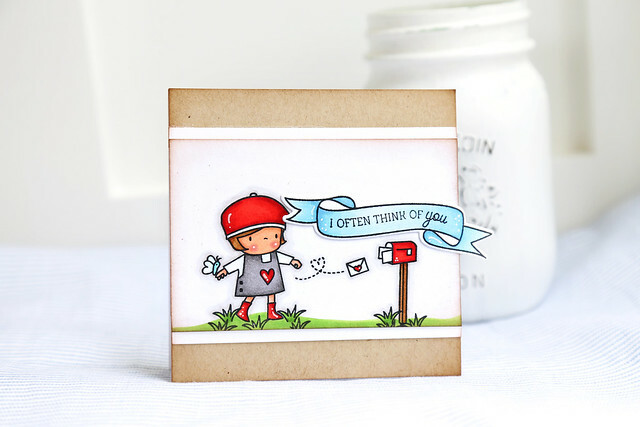 We're showing off the fun and very versatile sentiment set, Sunday Sentiments. 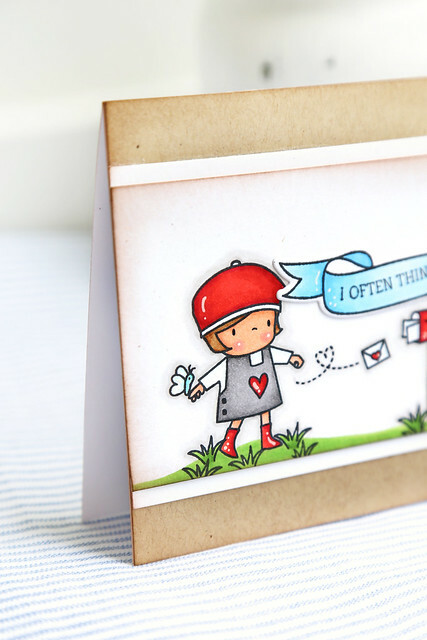 It's meant to work with the Sunday Stroll stamp set, but it can be used with any images, really. They look like the best of friends, and the long sentiment provides the perfect grounding for their stroll. Does the splatter look like dirt to you? good. we understand each other. if not, I still like you. Boys and critters and dirt. The stereotypes are true. Hi there! We're kicking off the Mama Elephant stamp highlight week with Sunday Stroll. It's full of mix and match possibilities - wait until you see what the rest of the design team has come up with! I thought the two bigger kid images looked like they were poised to throw things...but nice things, like balls or love letters... not pots or plates at each other's heads, just so we're clear. The beret-wearing gal has pretty good aim! And her outstretched back arm was the perfect perch for a butterfly. I paired the images with the wavy banner from Charmed. I thought the sentiment worked so well with the images. I hope you like it! Check out the ME blog this morning for even more Sunday Stroll - click! The circle from the Sew Fancy die set makes the perfect base for the wreath. 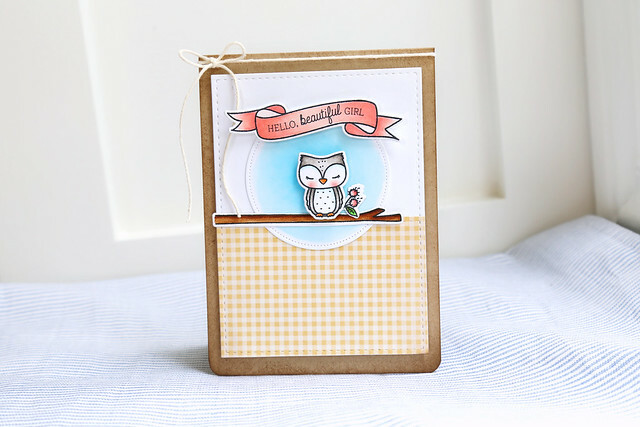 Can you imagine an owl-themed baby shower, with a slew of these sweet tags on the table? I die. 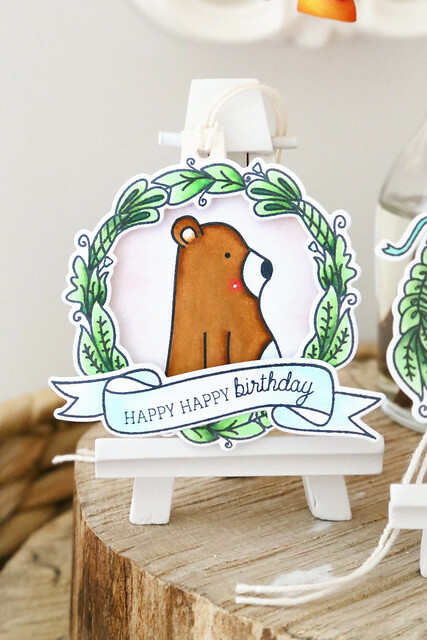 And I couldn't help but add in my favorite bear, from last month's Woodland Gifts. For all 3 tags, I mounted the wreath onto the circle base using foam dots. 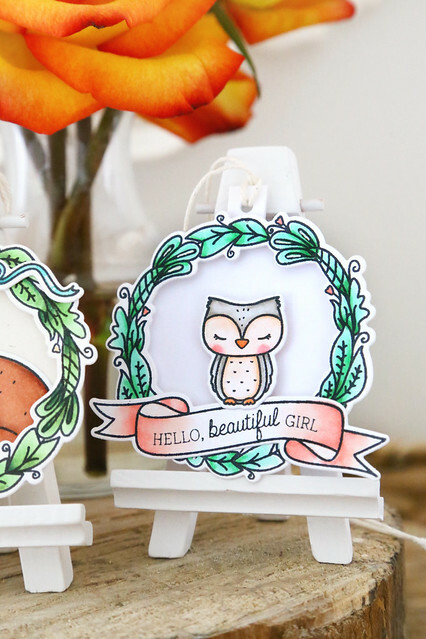 You could easily add some acetate to make these into super cute shaker tags! My crafty stash is a mess, and I couldn't find any since the house move. Hey there! 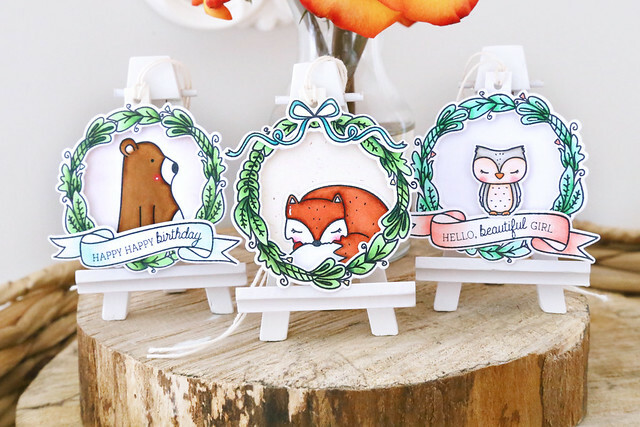 Mama Elephant and I are giving you the first look at Charmed, a whimsical woodland stamp set that I drew for them. 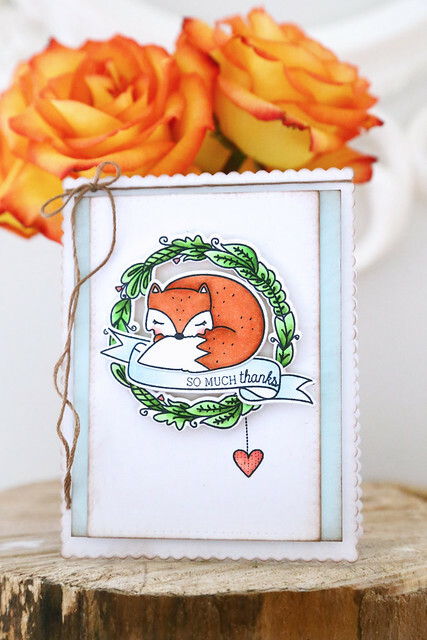 It features a leafy wreath and a sleeping fox that you can see on their blog. I chose to show off the sweet owl, perched on her branch with a little bouquet of flowers. The wavy border is also from the set and I just love it. Kryssi helped with designing the sentiments, and I love how they curve so perfectly inside the banner. My favorite thing about these animals are their little eyelashes! I think this owl is just so sweet. This was my first time making and photographing a card in the new house. It was especially exciting because I had THE Jen Rzasa in town to help start me off. We hung out for an entire day and did some stamping and groundhog watching. They are abundant in this area, yo. GIVEAWAY: The ME girls have graciously given me an extra set to gift to one of you! Leave me a comment telling me what you think of the new set and I'll choose a winner by the last stamp highlight day. Good luck! Hi there! 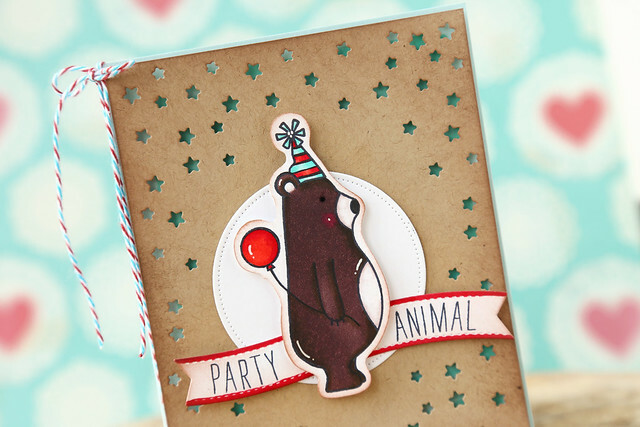 I'm here and on the Mama Elephant blog today, showing off the new set, Bella Letters. Let's talk about that bear from Woodland Gifts! He looks super excited, doesn't he? ha. I inked him up, but carefully wiped off the ink at the top of his head. Then, I masked his ear and stamped the hat from Ella & Friends. I added the stripes by way of a copic multiliner pen. I also used the same pen to draw in the balloon string (the balloon is from Woodland Gifts.) I colored and then cut out the entire image by hand. My favorite part of the card is the starry background. I grabbed a piece of kraft cardstock, ran it through the die-cutter once with the Starburst Cover die, turned it around and ran it through again. It makes such a great frame to a focal image! I hope you like it, and thanks for stopping by! I created a little scene in my fish bowl, and tipped the container of fish food to make it look like it's feeding time. I don't know what kind of fish that is, but I once had a goldfish that we kept alive for more than 3 years. Impressive, no? My kids found this one especially hilarious. My 5 year old still looks at me and yells: TANK YOU! remember, like your card? ha ha. I don't know why I didn't use the adorable little birdies in the set! I just started creating and came to this. Truth be told, it's not my favorite card, but I do enjoy how the sentiment looks, curved around the circle die-cut.